At a special retreat for members of the Nigerian House of Representatives’ Committee on Civil Society and Development Partners considering the Non-governmental Organizations Regulatory Bill (NGO BIll), SPACES FOR CHANGE | S4C delivered an expert legal analysis of the draft statute, highlighting the intersections with existing legislations and the implications for civil society and charitable operations in Nigeria. The Committee has been charged with the responsibility of considering the Bill for the Establishment of the Non- Governmental Organisation Regulatory Commission for the Supervision, Coordination and Monitoring of NGOs and CSOs and other related matters in Nigeria, and reporting back to plenary for further legislative action. S4C’s presentation provided the federal lawmakers with a detailed analysis and critique of the draft regulation, with a special focus on the extent of interplay between the bill and extant regulatory frameworks. 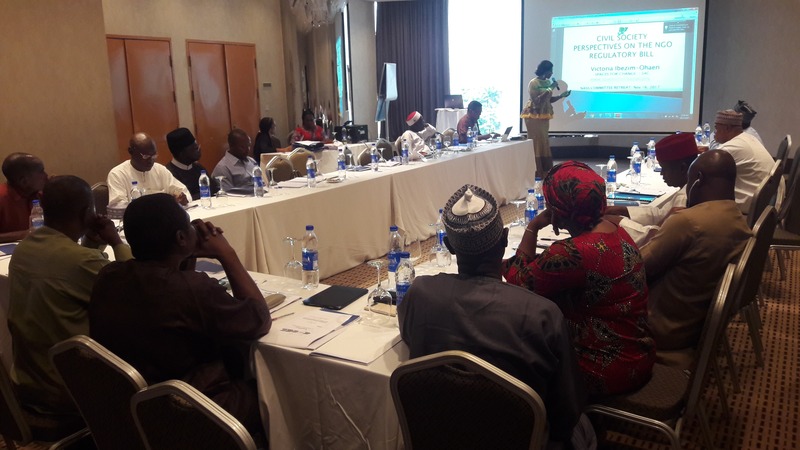 S4C extensively evaluated the adequacy of existing rules and proffered recommendations for improving the regulatory landscape for non-profit and civil society operations in Nigeria. The presentation builds on the organization’s longstanding research studies aimed at building knowledge and evidence on the (in)adequacy of the legislative and regulatory systems for preventing the exploitation of charitable resources in the country. With regard to the first objective, the Bill proposes to create an NGO Regulatory Commission that would undertake a number of statutory functions such as maintaining the register of NGOs & international non-governmental organizations (INGOs), coordinate the activities of NGOs & INGOs; conduct regular review of the register; provide policy guidelines to NGOs, overseeing the finances and operations of non-profits, licensing NGOs, and deciding which NGOs to license(register) and which not to. Sections 11 – 13 of the NGO Bill prescribes that every NGO operating in Nigeria shall be registered with the proposed NGO Regulatory Commission. Furthermore, the Bill seeks to introduce multiple registration for NGOs. The range of organizations compulsorily required to register with the proposed regulatory body are already corporate entities legally incorporated and registered by the Corporate Affairs Commission (CAC) and the National Planning Commission (NPC) as the case may be. In effect, the Bill introduces multiple registration for NPOs. This multiple registration requirement is not only onerous, but also defeats the well-settled principle of legal personality. Under Nigerian law, legal registration presupposes that an organization once registered, assumes in perpetuity, the status of a body corporate with perpetual succession and a common seal. It is instructive to note that corporate entities that operate for profit do not have a validity period to be registered as legal entities. Targeting only NGOs for multiple registration should not be encouraged. Part C of CAMA specifically regulates the registration of incorporated trustees, which is the form under which most NGOs are registered. The October 2016 three-in-one National Code of Corporate Governance issued by Financial Reporting Council of Nigeria (“FRCN”) also seeks to regulate public and private companies as well as non-profit organizations and NGOs. The National Planning Commission registers organizations that rely on donor funds especially international non-governmental organisations. As seen above, different institutions are already statutorily mandated to register and regulate the activities of for-profit and non-profit entities in Nigeria. Reassigning these functions to a new regulatory body without repealing subsisting legislations that have already covered the field will breed confusion and unleash a maze of conflicting legal frameworks. On the issue of national interest and security including counter-terrorism considerations, the Bill is replete with vague phrases framed around the objective of ‘national security and national interest.’ What constitutes national security threats against the interest of Nigeria was not defined just as the criteria for making such determinations were not stipulated. Vague and overly-broad representations in rule books often leave ample opportunities for state misuse of power. Nigeria already has in force, a plethora of laws and agencies that monitor the flow of money in and out of Nigeria and to corporate entities. These laws include the Economic and Financial Crimes Act (EFCC Act), Terrorism Prevention Act (TPA), Money Laundering Prevention Act (MLPA), National Financial Intelligence Agency Act 2017 and so forth. Part of the mandate of the Special Control Unit against Money Laundering, SCUML, under the Ministry of Industry, Trade and Investment, is to “monitor, supervise and regulate the activities of Designated Non-Financial Institutions (DNFIs) in Nigeria in consonance with the country’s Anti-Money Laundering and Combatting of the Financing of Terrorism regime. NGOs are categorised as DNFIs. The SCUML and the NFIU take the lead for the monitoring the source of funding for DFNIs, including NGOs. Each of these agencies subject corporate entities, including NGOs, to varying levels of financial and operational scrutiny. For instance, NGOs are required to report suspicious transactions to the NFIU, and to maintain all necessary records of transactions, both domestic and international, for at least five years following completion of the transaction (or longer if requested by the NFIU in specific cases. The CAC also receives annual returns and financial statements from NGOs. The NGO Bill did not only reproduce these reporting obligation, but went further to reassign the statutory roles of the EFCC, NFIU, SCUML, TPA etc to the new NGO Regulatory Commission. While replicating these regulatory functions, it neither repealed the laws establishing existing regulatory agencies nor abrogated them, creating confusion on where final NGO oversight and responsibility lies. Previous experiences, especially during the military era, reinforce widely-held assumptions that legislation enacted for the regulation of NGOs in Nigeria could be hijacked and used to legitimize the tightening environment for civil society action, including the restrictions on basic freedoms of expression and assembly, persecution of political dissent, and increased surveillance of citizens. For these reasons, the bill should not be considered for adoption. Lawmakers thanked S4C for the presentation, and more especially, for throwing light on the seeming gaps and inconsistencies between the draft regulation and other extant legislations. The Committee Chair, Honourable Ohiozojeh Akpatason, representing Akoko-Edo Constituency in Edo State, observed that S4C’s expert analysis and information will assist the Committee in the development of its final report to the House of Representatives.